NOTE: The CK-1G1 has been discontinued! Skutch CK-1G1 The CK1G1 "Hold Button" Adapter was designed to provide Music/Message On Hold "Specifically" for the GE 2-9451 telephones (and 2-9450 phones when this unit is connected to a GE 2-9451 phone on the same system). This Music/Message On Hold unit sits easily under any of these GE phones and a small light board that attaches nicely to the top of the phone to give you continued line indication on that phone. This unit can be used by all of the phones in a system. It doesn't matter how many phones you have, one CK-1G1 Music On Hold unit will work with all of them. The unit works automatically in the background every time you press the HOLD button on any of your GE 2-9451 phones. This unit lets your message sound its best "On-Hold" from Cassette Players, CD Players, PC Sound Card Output, or any Powers Productions Digital Player (including our Pre-owned models)... 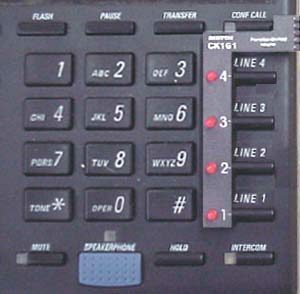 The GE 2-9451 Music/Message On Hold unit is much better than most any other telephone Music On Hold adapter currently on the market, short of buying an expensive telephone KEY system (PBX/KSU). 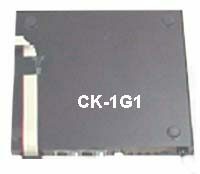 Note: The GE 2-9451 (/9450) Phone DOES NOT COME WITH THE Skutch CK-1G1 interface!! 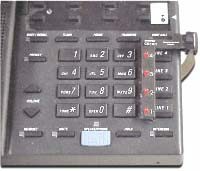 We are using the image (Keypad) of this phone to illustrate where the CK-1G1 light board will be positioned when in use.